The best post you have ever done! Unbelievable, I have no words for this, it is mesmerizing!!! One needs to watch it again and again to see how great it really is! We are so touched that you were moved by the montage! The beauty of the shots really speak for themselves. Thanks for watching! I’ll admit that I felt a bit teary-eyed myself! These shots have such a sentimental value for so many of us. I hope the montage can help expand the audiences of the films to which it pays tribute! Thanks for your comment! Love this! Incredibly well done. My mom wants to know – what is the music used? We loved it! Thank you Pothik! The music the Title Theme from the movie Pakeezah (1972). 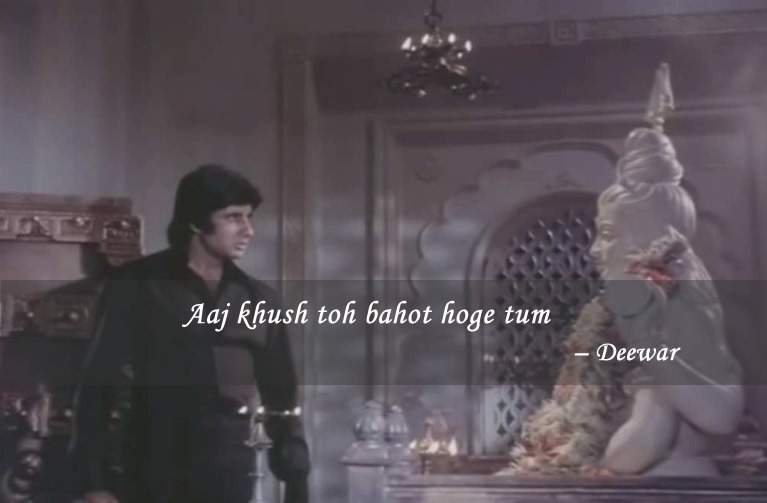 It’s one of the best compositions from Hindi films! We are so glad you enjoy our blog! Thanks for reading! Bravo well done. A good gift for the new year. My humble submission is that there is an over representation of Shringara Rasa, with bits of Karuna, Veera, Adhbhutha and Hasya. That is unfortunately the limitation of Hindi Cinema, even Indian Cinema. To be fair I can think of two fabulous examples of Bibhatsa or disgust- Vijay (Gurudutt) saying Jinhe naaz hain Hind par woh kahaa hain in Pyaasa and Nawabjaan (Veena) calling out to Shahabuddin to witness the bleeding of his daughter’s feet in the climactic scene of Pakeezah. Well done , you two. Thanks for the gift and hope 2016 will be full of many more such gifts. PS: You must do something relating to the fabulous Sadhana. Great thoughts Gaby! 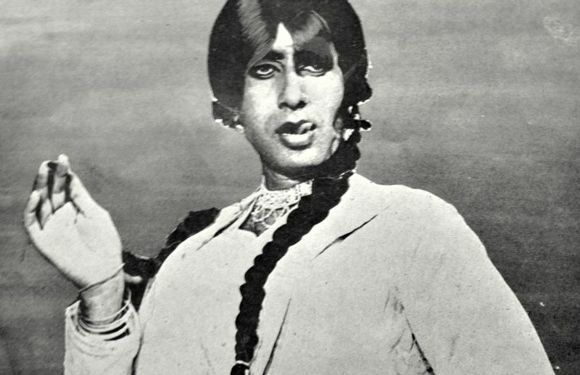 The Rasas of classic Hindi cinema indeed deserves its own post! The two examples you described of Bibhatsa are some of the most powerful scenes in film history to this day. I think we’re definitely going to have to do an extended version or sequel to this montage one day to include even more of our favorite shots like these! Thank you for reading and we hope you have a happy new year! A difficult task, well accomplished! Thank you for watching the montage Ashok! 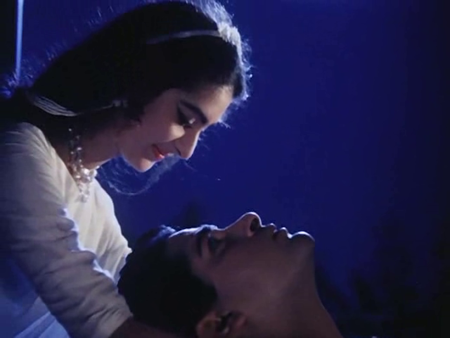 1] Saira looking into Shammi’s eyes so loving with just moonlight and the soft billowing breeze. At the end of the song Ehsaan Tera Hoga From Junglee. Did any couple look more beautiful on film? What fantastic additions! I particularly love the scene from Ehsaan Tera Hoga–the simultaneous tension and romance in the song is breathtaking! I also always need a box of tissues during the funeral scene from Haathi Mere Saathi (1971). Moments like that are truly special in Hindi films. Thanks for the contributions! You missed out on Pran smoking !! Pran is one of my favorite actors! He’s in a class of his own. If we had more time, there are many shots of him worthy of inclusion–maybe we’ll make a sequel! This was incredible! I’ve already watched it 5x since yesterday. Also, the commentary with it was spot on as well. Of course everyone has their own personal favorite Bollywood scenes (intro to Jo Wada Kiya Woh anyone?) but this was a great montage of so many classics that just about everyone can agree are incredible! Loved that you captured “the wink” and that clip Shashi Kapoor was perfect! The Pakeezah music was the perfect background too. Thanks Shabnam (and nice Kati Patang reference)! There was no way I could make a montage without including a solid signature “wink” or two (https://mrandmrs55.com/2012/03/11/how-to-wink-like-rajesh-khanna/)! And I could not agree more about Jo Wada Kiya Woh–that set and those costumes are to die for! Glad you enjoyed it Roy! Happy New Year! Sounds like you brought in the new year in style! Thanks for reading! growing up, while listening to songs from a radio in a pan shop next to bus stand, I felt a glimpse of the sublime feeling, but I lacked the vocabulary and mainly lacked the maturity to describe or even to recognize them. Fast forward 30 years and by happenstance I heard ‘chelte chalte’ from Pakeeza…and the love affair started. Thank you for your compilation.